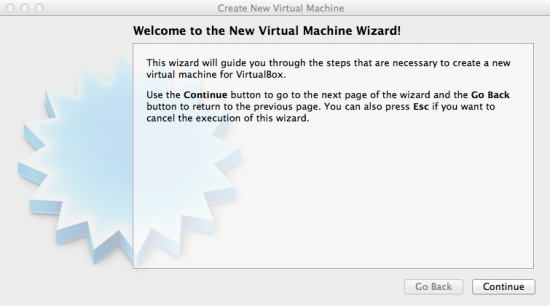 3) Choose a Name for the VM (e.g. 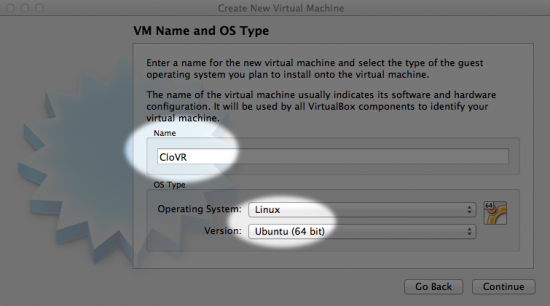 CloVR), select ‘Linux’ as Operating System and Version as ‘Ubuntu (64 bit)’. 4) Choose ‘2048’ MB of RAM as a minimum. 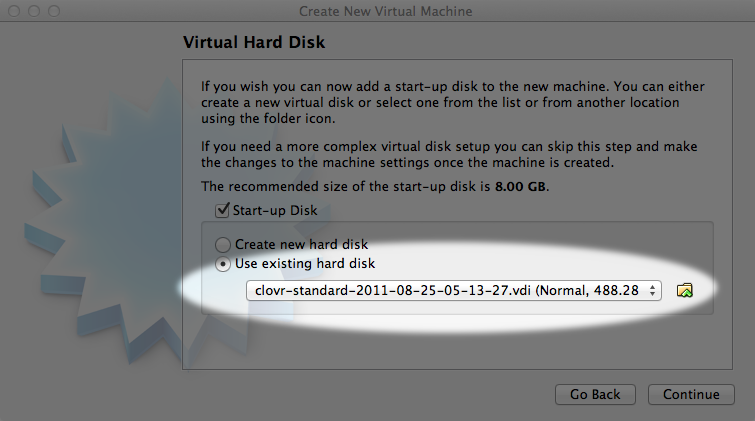 5) Select ‘Use existing hard disk’ and browse for the .vdi file (preferred) or .vmdk that is included with the download. 6) Check the summary screen and finish the installation with “Create”. Click on the VM and select “Settings” and then “Network”. 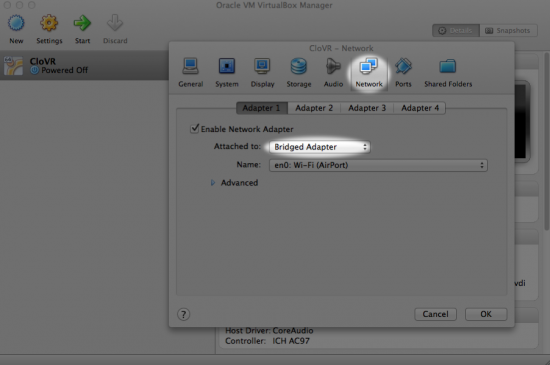 “Bridged Adapter” is preferred but may not work with wireless networking and some other networks. For further information, follow the link below. Click “Auto-mount” and then “OK” when done. Repeat this for each shared folder. 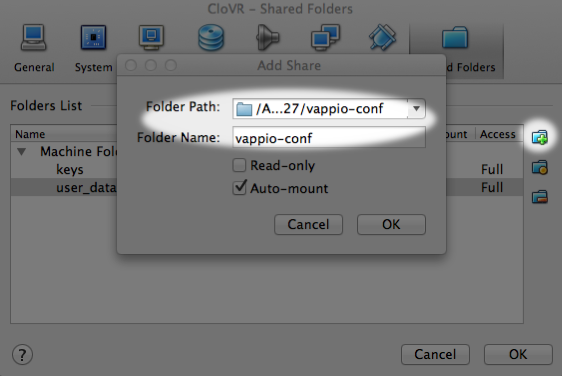 Repeat this procedure for the “user_data” and “vappio_conf” folders if necessary. To edit the “Folder Path” so that it matches the path on your computer to the corresponding folder, click on the “Edit Folder” icon (the middle folder icon with the yellow dot). 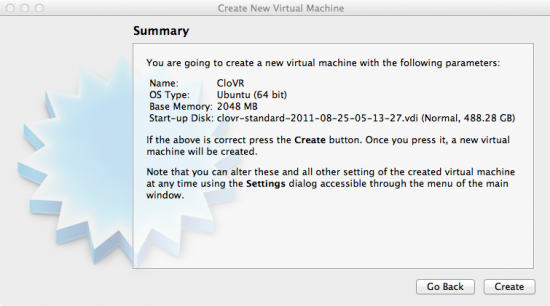 9) To start CloVR, highlight the ‘CloVR’ VM in the VirtualBox window and click ‘start’ to boot CloVR into Virtual Box. 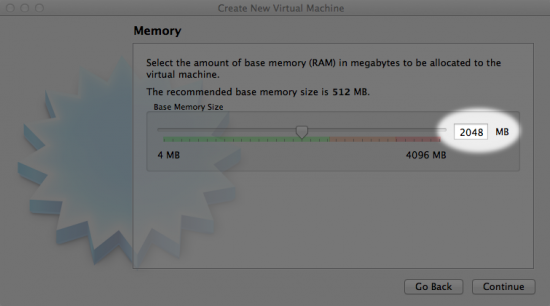 a) Networking: Change your Network settings (see above), if the terminal during the boot process reports “No external network access” or if the desktop display reports “Networking: No Address”. 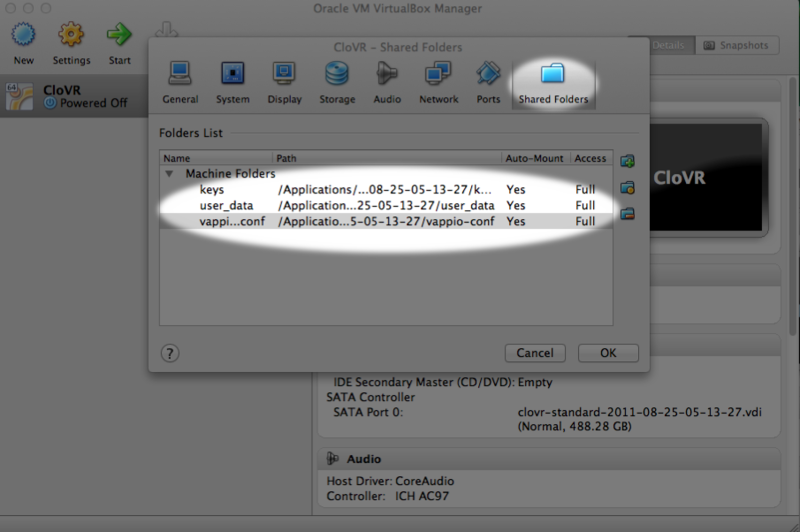 b) Shared folders: Check your shared folders settings (see above), if the desktop display reports “Shared folders: Not OK”. a) Node type: Should display as “master”. b) Networking: Should display a “valid IP address”. c) Shared folders: Should display as “OK”. NOTE: Please wait for few minutes after you boot the CloVR image to see these values. 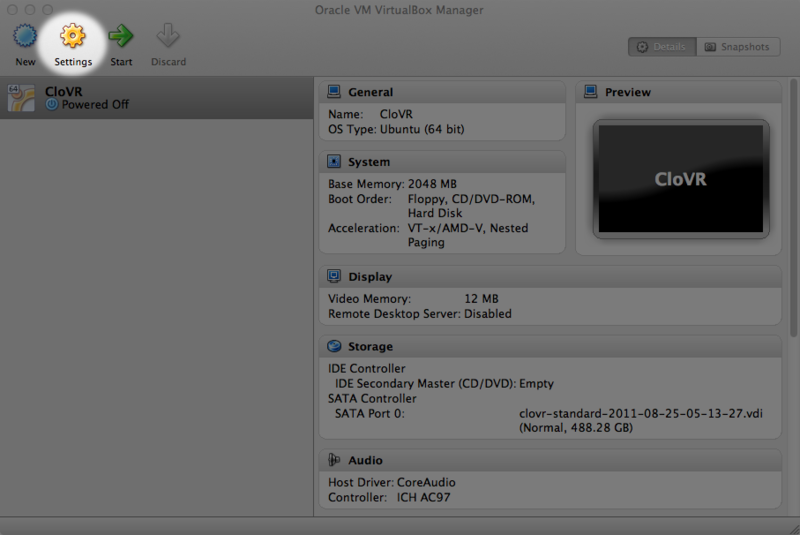 It takes some time to update the status of the node to “master”, network to a “valid ip” and shared folders to “OK”. The CloVR dashboard can be accessed by navigating a web-browser to the IP address listed under the Networking field.